The income statement for the calendar year 2018 will explain a portion of the change in the owner's equity between the balance sheets of December 31, 2017 and December 31, 2018. The other items that account for the change in owner's equity are the owner's investments into the sole proprietorship and the owner's draws (or withdrawals). A recap of these changes is the statement of changes in owner's equity. 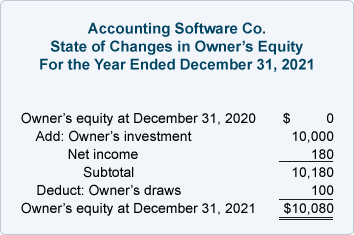 Here is a statement of changes in owner's equity for the year 2018 assuming that the Accounting Software Co. had only the eight transactions that we covered earlier. The format of the statement of changes in owner's equity can be used to determine one of these components if it is unknown. For example, if the net income for the year 2018 is unknown, but you know the amount of the draws and the beginning and ending balances of owner's equity, you can calculate the net income. (This might be necessary if a company does not have complete records of its revenues and expenses.) Let's demonstrate this by using the following amounts. Starting at the top of the statement we know that the owner's equity before the start of 2018 was $60,000 and in 2018 the owner invested an additional $10,000. As a result we have $70,000 before considering the amount of Net Income. We also know that after the amount of Net Income is added, the Subtotal has to be $134,000 (the Subtotal calculated in Step 4). The Net Income is the difference between $70,000 and $134,000. Net income must have been $64,000. Since the statement is mathematically correct, we are confident that the net income was $64,000. You can reinforce what you have learned by using our Quiz for the Accounting Equation and our Crossword Puzzle on the Accounting Equation. The remaining parts of this topic will illustrate similar transactions and their effect on the accounting equation when the company is a corporation instead of a sole proprietorship.